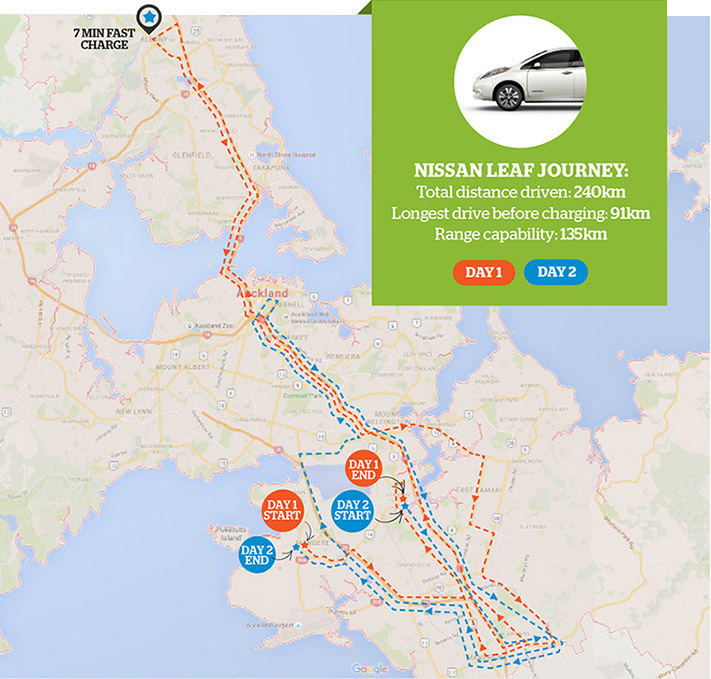 We took the electric vehicle far and wide through the Auckland sprawl over 2 days. Over 2 days in Auckland, I had 6 business meetings spread far and wide: from Albany to Takanini, East Tamaki to Mangere. With 135km of range in my rented Nissan Leaf, notorious Auckland traffic to negotiate, and just 7 DC fast chargers available in the city, would I end up trumpeting the glory of an EV future or be left longing for petrol-power? The BEV Leaf I rented (from BlueCars.nz) looked like a typical small hatchback. The electric vehicle giveaways were its slightly “futuristic” feel, battery range and motor power indicators, and a sprinkling of pale blue lights — the colour seemingly adopted by EVs. The Leaf comes highly specced with infotainment equipment. However, this highlighted a downside of imported EVs: the control and connectivity displays are unusable unless you can read Japanese. That’s a shame, as this car had Bluetooth connectivity, built-in navigation and NissanConnect (that pairs with your smartphone to show charging locations on the in-car display and lets you control charging and climate control functions). But all I got was a swag of indecipherable touchscreen buttons. It was strange starting the Leaf and hearing … nothing. Despite being heavy at 1.5 tonnes (blame the batteries), the Leaf was a rocket off the line, outgunning anything at the lights. Overall, it was zippy and responsive at city speeds — great fun to drive. The regenerative mode was good to use in start-stop city travel, reducing wear on the brakes and adding to range. On the highway the Leaf felt like a conventional car, plenty powerful with the silence broken by wind and road noise. And what about that much-feared Auckland traffic? Well, the Leaf scoffed in the face of jams. 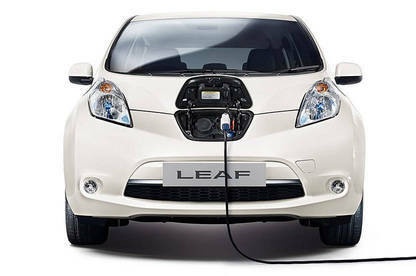 The Leaf is more efficient at crawling speed than at highway speed. When everything grinds to a halt, it doesn’t use any battery. Any range anxiety disappeared, as I realised 135km covers a lot of city driving, even in the Auckland sprawl. I only charged once at a DC fast charger, topping up for 7 minutes outside The Warehouse in Albany, and replenished the battery with an overnight charge. In total I drove 240km, the longest segment between charging being 91km, and never saw the range indicator dip lower than 58km. The biggest charging stress was finding another Leaf using the fast charger. Never mind “range anxiety”, I experienced “charge anxiety” — what happens when another EV is using the charger you need. Charging an EV overnight is easy if you can park in a garage or on a driveway close to a power point. But you could run into problems if you live in an apartment, or park on the street. Something to consider before buying an EV. So, what was the conclusion of my Auckland EV experiment? Was I left longing for petrol-power? Absolutely not. 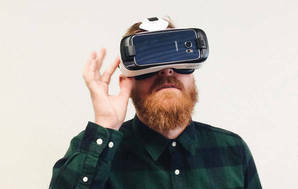 First Looks are trials of new and interesting products from the perspective of our product experts. Our lab-based tests offer truly objective product comparisons. The Nissan Leaf was rented from BlueCars.nz. I test drove a 2014 Leaf recently and was SO close to buying it on the spot, even though it was slightly out of my budget. It had amazing acceleration and was an absolute dream to drive. The thing that killed the deal was a loud, high pitched whistle/whine that came from somewhere under the bonnet, I think it was the power inverter. This was apparent anywhere from crawling speed to highway cruising. Apparently many people don't hear it or it doesn't bother them, but to me it was a deal breaker, it would have driven me insane (excuse the pun). Bought a Prius instead, and while it occasionally makes the same noise it's far quieter and you can only hear it with the windows down when driving slowly. We have been looking at purchasing a Leaf, but range anxiety has already hit me, even though we don't own one yet. We're looking at the $15,000 mark which will get us a 2011 Gen 1 leaf with around SoH79%. As the Leaf's age, the SoH reduces and range anxiety will increase. I need to be able to do 70km per day, and with the heating going, the lights on and the wipes going full tilt, I am concerned that this will dramatically eat into the Leafs range. Interestingly on the Ecotricity's website, they state that "EV batteries are expected to last about 8 – 10 years with the current technology" So that basically discounts purchasing all pre 2011 Leafs on TradeMe because they will need $9,000 spent on a battery replacement in the short term. There are apps on the web which will scan foreign print and will translate to English. This is ideal to use with foreign car manuals written in a language that is not familiar to the reader. We've had a Gen2 24kWh Leaf (~140km range) since late October and have loved it so much! It beats our Lexus hybrid for drive feel in traffic and at city speeds. The Lexus RX hybrid SUV still wins on open road long distance trips for drive feel, but it uses 8.3L of 91-octane (~$15-$16) per 100km. We aim to be respectful to other EV drivers and always check-in on the Plugshare app so they know when they can get onto the charger. If you're driving primarily for city commute (and not for some special purpose like a ute for heavy towing), as far as I can tell there's no reason not to switch to a Leaf, especially if you have a long-ish commute. My old Subaru Outback 2.5L feels so sluggish now in comparison, and the petrol savings payback the cost difference between selling your old car and buying a Leaf in a matter of 1/2/3/4 years depending on your commute distance. All Jap import Leafs (S, X & G spec) can have the dash interface converted to English. The base S-model can have the stereo head unit swapped out for any double-DIN type one. (The Japanese A/C control-integrated touchscreen only applies for the X & G spec). We had considered buying a Nissan Leaf for some time, but one day we saw one on a car website, it was the Generation II, having a 200km range instead of the Gen I's roughly 125km. We tried it out and were immediately sold. I has amazing torque because it has no gears, it is absolutely silent except for road noise (your REALLY notice the change from smooth hot mix to cold mix tarmac surfaces). My partner reads Japanese but I don't so we had the US console put in and it gave us access to many more features. Two days after we bought it we went on a trip to Tauranga for the weekend. We downloaded the Plugshare app to our phone (which Bluetooth connects to the car) and found free charging stations along the way. We had not problem getting to and from Tauranga. The BoP has a limit on compatible fast chargers, so we had to pay for a charge on a ChargeNet unit. The cost was $8.50. That is ALL we have paid for energy since we got the car, travelling about 1,500km, thanks to the free charging stations supported by various energy providers. As time goes on the batteries will degrade in performance, but with a recycle program in the works one should get a new (and improved) battery pack for $5,000 - that would be needed perhaps once in 10 years. Considering the minimal costs of energy, building that cost into your annual expenditure is extremely good ROI. The numbers speak for themselves. 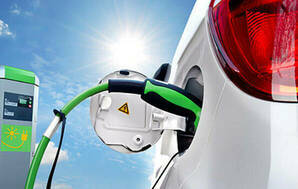 As the government website touts, an electric car has 20 moving parts, while a conventional car has 2,000 of them, many involving violent explosions happening in the cylinders, so annual maintenance costs will be absolutely fractional. There are two main displays you need to be aware of. One is the battery remaining, which provides an absolute value of how much charge your battery contains. The other is virual km remaining. This can be manipulated depending on how you drive. By driving smoothly and avoiding massive acceleration (tempting though that is! ), or using the cruise control on the highway, you can drive more economically and get more virtual kms. There is a bit of re-learning involved when driving. There are two practical modes: D for driving on the highway or flat when there is no stop-go. B is used where you want the engine to break instead of the discs for stop go or long downhill sections like the Bombays or Kaimais. By using these modes carefully you can really eke out the range of the vehicle. Finally, but significantly, those who drive EVs are a community. When we see another EV on the road we acknowledge each other with a wave or flash of lights - we know we are on the leading edge of a wave. When I have met other EV owners at charging stations we always have a great chat, and without exception everyone has said there is no going back for them. We love the economics, and we love the reduced ecological footprint.